Answer: Great question, since they all look like points of light to the unaided human eye. But there are several ways to tell them apart. You just have to know what to look for. The most obvious difference is how they move through the sky. On any given evening, all those points of light rise in the east, follow a smooth arc across the sky, and set in the west. However, over time, five of those points of light do something slightly different — those five are called the planets. There’s also a difference in their intrinsic appearance. For more about that see: To Twinkle or Not. At present, Saturn is the only planet visible to the eye, and you’ll need to stay up late to see it. Saturn is in the constellation Leo, rising around 3 am. Over the next few months it will loop west, and then east, moving out of Leo into Virgo. Look at the dotted line in the graphic. 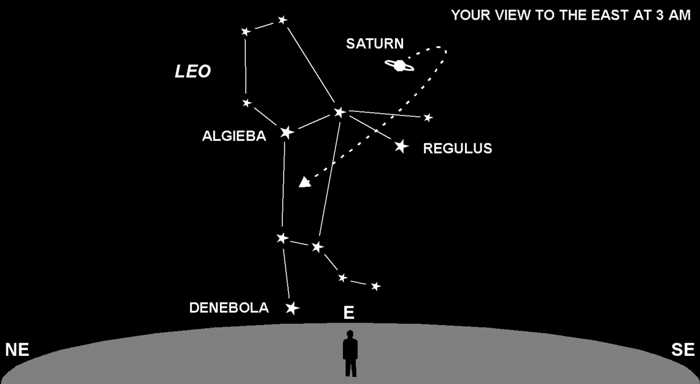 If you note the position of Saturn relative to the stars of Leo, you’ll see it change over time. It’s a gradual drift, caused by a change in our perspective as Earth orbits the Sun.